I just bought 50 real cardboard folders to organise my PhD thesis. 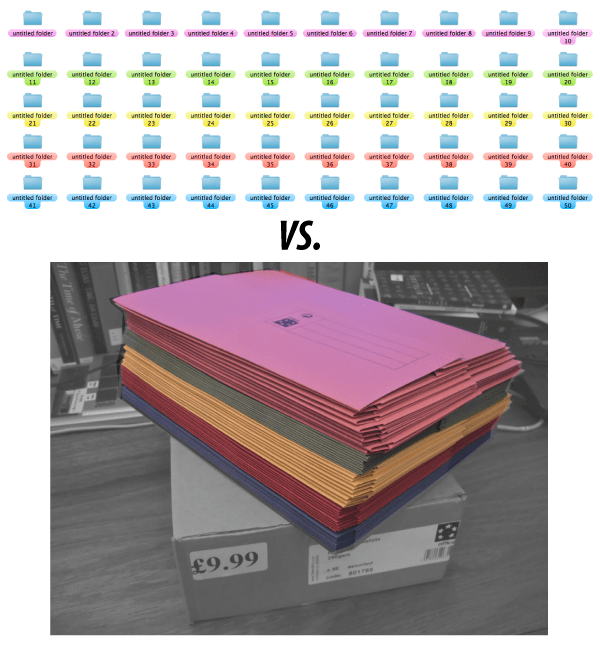 This has led me to wonder how much it would cost to physically replace all the digital folders currently in the ‘PhD’ folder on my laptop (whilst also providing a short procrastination exercise to avoid doing writing). Cardboard folders are 20p each. This is rather expensive, and shows that even tangible user interfaces that use paper and card for the tangible objects (such as the D-Touch system) aren’t really scalable to the same degree as a purely digital systems if used in a one-to-one manner. I think a big problem for tangible interfaces if they are going to become regularly used is the scalability of the interface and importantly the cost of each tangible. However, it would be great if something like the Siftables only cost 20p each! But what about the stuff that goes into the folders? Thats alot of printer paper, ink and DVDRs! Good point Ad. Will add that in to the next (and perhaps slightly less dubious) equation.